We stayed here over the songkran festival and had a brilliant time. Beautiful villa, welcoming hosts and a perfect location. The view is outstanding and our two families (4 adults and 5 kids aged from 5-10) all had a ball. Book it! Following a recent stay at this villa with a group of 8 people, for 9 days we can all highly recommend this villa. 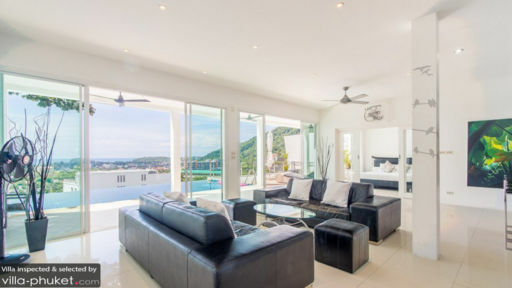 This is a very accommodating villa, we found all the bedrooms were of a more than adequate size, all ensuite, well furnished and comfortable, it was easy to settle in to the villa very quickly. 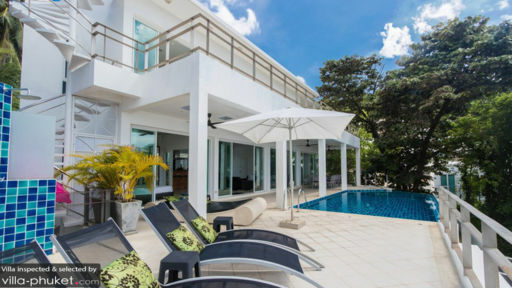 The Villa is maintained to a high standard and the helpful owner is close enough to resolve any issues one might have or provide you with invaluable local knowledge. The kitchen is very well equipped for all manner of budding chef’s and amateur chef’s alike. The Huge refrigerator is able to hold enough food for a large size group and comes with the added bonus/necessity of providing cold filtered water and an ice dispenser which comes in very handy. The living room is very open and comfortable place to relax in. The pool and it’s surround patio area is comfortable, clean and provides a relaxing space where you can either spend the whole day relaxing and enjoying the view of the sea and sunset in the evening. See pictures attached. Due to the location of the villa the surrounding area is not very busy so there is no through traffic or general noise so it is quite a relaxing location, there was some construction on the property next door which should be completed by now. All that's left to do once you've booked this Villa is to decide if you are a Chang person or a Singha person, me I've still not decided, so I guess I'll have to go back. This is our first time going to Phuket with my mother, my brothers and our families. And we all agreed that the Villa Ginborn was perfect. On arrival, we were greeted by the friendly owners, Pia and husband. The first impression was excellent - clean and spacious. Although the price is comparable to hotel accommodations, but the layout of the place encouraged lots interaction among the extended family members. 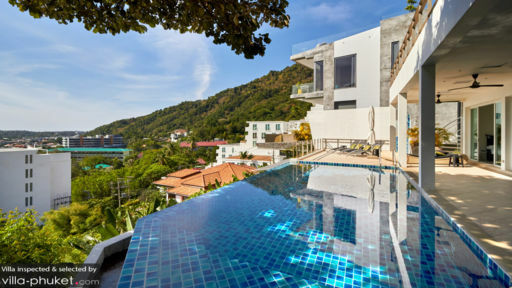 Other than exploring Phuket and the nearby islands, we actually spent time relaxing in the villa. Enjoyed the play at the pool, the barbecue beside the pool (thanks to owners for arranging for us last minute), the card game sessions at the living room, the video sessions in the living room on the second floor (quite a wide selection of titles), and most of all - the cooking and chatting in the open concept kitchen (very well equipped). The place was quite easy to clean up as the necessities (trash bags and liquid detergents) were there. The checkout was simple and problem-free. We really loved the place. The stay was very comfortable and relaxing. It was like a home away from home. Definitely my first choice if we are coming back to visit!